As usual in dicotyledonous angiosperms, the seedlings of subfam. Sanangoideae and subfam. Gesnerioideae (Coronantheroid and Gesnerioid Gesneriaceae sensu Weber 2004) comprise two equal cotyledons (they are “isocotylous”, from the Greek isos = equal), a hypocotyl, and a radicle. Germination is “phanerocotylar”, with the two unfolding cotyledons being the first photosynthetic organs. In subfam. Didymocarpoideae (Epithematoid and Didymocarpoid Gesneriaceae) a different pattern occurs (see illustrations below). 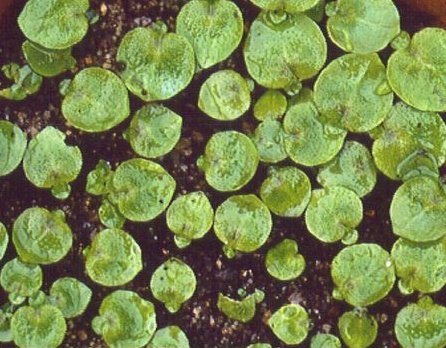 The two cotyledons show unequal growth – they are “anisocotylous” (from the Greek anisos = unequal). One cotyledon, the “macrocotyledon”, shows continuous growth, while the other, the “microcotyledon”, remains small and is without function. The development of a shoot apical meristem is often delayed and displaced to the base of the macrocotyledon. In Monophyllaea, in the “unifoliate” species of Streptocarpus and in a few other genera, the larger cotyledon (macrocotyledon) develops into the only foliar organ of the plant and grows continuously during the whole lifetime of the plant (see Exceptional Morphologies). These seedlings of Microchirita lavandulacea nicely illustrate the development of one of the pair of cotyledons, while the other atrophies. This species otherwise produces stems and leaves in a “normal” fashion, unlike Monophyllaea and some species of Streptocarpus, which only ever produce the single cotyledon that may grow to enormous size.